Well over a year ago, I upgraded my main machine at the time to Windows 10, and the one app that caused install and running issues was Microsoft Money. Since then it’s been pretty stable for me (and I’ve even got it running on a new, totally different machine), but I’m always well aware that one day, I’m going to run into some insurmountable problem with it, and then I’m hosed. So, better to think about a replacement for it while it still works, and what better time for that than over the New Year, when nothing much is going on and I have a long weekend. First up would be Quicken, but I loathe it with a passion. So the real “First up” is Moneydance. I’d read a few good reviews of it online, so why not. I slapped down my $50 from PayPal, then downloaded and installed it. 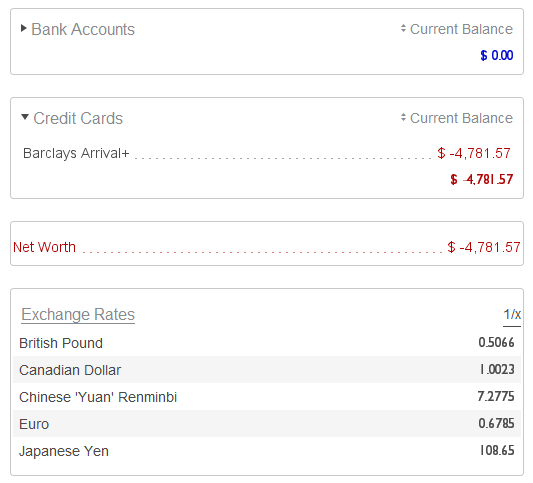 I imported one account from Money to try it out. I'd have to say I'm extremely disappointed so far, and that impression is just based on the UI. It has all the hallmarks of being developed and heavily used on one OS (MacOS), and sloppily ported over to another, the one I'm using (Windows 10). The first thing that struck me was the fonts. (Note: I changed the font size setting to +2 to show things better in the images; there is no option to change the actual fonts.) The first image shows the panels on the Summary page. The total value for the Credit Cards panel is in a different (and very, very nasty; on the border of being illegible) font from the value displayed for the individual record. This ultra nasty font is repeated in the Exchange Rates panel. Even better, that list of rates shows that the font glyphs for the digits are not even the same width, a solid prerequisite for number lists. Hold on to that thought for later. Next up: OK, nice UI with the panels, however the padding for the contents of each panel is not consistent. Examples: the Net Worth panel has no left/right padding at all, yet compare that to two panels above it. Messy. Now take another look at that Exchange Rates panel: the "1/x" heading has no right padding, unlike the (nasty) list immediately below it. I then switch to the detailed page for the one account I have. 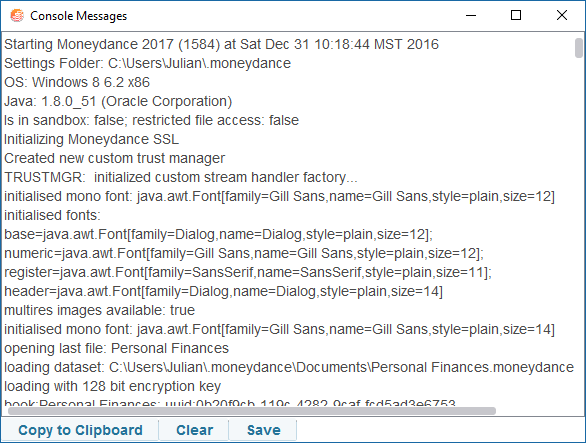 I took an image of a slice through the table showing some older transactions. Notice first of all that I've switched to "Single Line Mode" and yet the column headers are still in "Two Line Mode". Now take a look at the complete mess that are the fonts. That nasty numeric font now really shows how horrible it is: look at the wavy list of totals on the right, when they should all be the same width. Even better, I've opened up a transaction: the Date data entry field is displayed in a different better font, yet the data entry Charge field is back to the crappy font. Why the difference? And look at those up/down arrow icons in the edit row: why is the one for Bills not highlighted unlike the others? I'm afraid it was at this point that I just gave up on it. Having read a few posts on their Help site, I took a look at the Console Window. Wow, that's the first time I've seen Gill Sans called a mono (monospace?) font, let alone used as a default font for a Windows application. Gill Sans is not installed as part of Windows for a start (I just checked on a bare bones VM), so where's Segoe UI, Cambria, Calibri, Consolas? It so happens that I have a couple of versions of Gill Sans on this laptop (bold, condensed, but no regular). Is that the source of the font problem? And then I see the buttons on the Console Messages window: they do not have hover semantics (in other words they don't change color or get a different border when you hover over them). So maybe they're not really buttons like the OK/Cancel buttons elsewhere in the app. For fun, on that transaction list above I clicked the This Month "button". The opened-for-modification transaction was put at the bottom of the table. Clicking All again left it there (but it was "frozen", no edits allowed) and brought up the opened transaction back in the list. Sob. Nope. The UI has put me off even trying it out as a personal finance app. I'm done. While I am not an expert, I believe the issues your having are also related to Java. 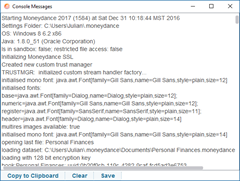 There are known issues with Java font rendering on high-resolution displays. I believe Java 9 is supposed to address some of these issues. Ernie: Indeed. I was deliberately trying not to mention Java, but instead concentrating on the usability and user experience of the product. To have an app versioned as "2017" and yet have such flaws in the interface when all you have to do is look at the other apps you use every day (for me: Office, Adobe Creative Cloud, Visual Studio, Firefox and web apps, etc etc) is unconscionable. After all, I work for a company that makes UI controls for Windows developers (OK, they're for .NET and not Java), so seeing at first hand some downright unusable UI widgets in action in a successful app was a real eye-opener. As a small example: that transaction grid? Just terrible. If we sold that as a widget to our customers, we'd be pilloried and rightly so. So although I can see it's easy to blame Java and AWT to a certain extent, it is still up to the developers to mitigate or work around the issues. To me, it's as if no one really tested the app under Windows (or, worse, did, but didn't give a damn). It's time to start a new product. Use your lovely controls to build a beautiful and functional replacement for Microsoft Money. Rob: It's starting to look like that could be the answer. 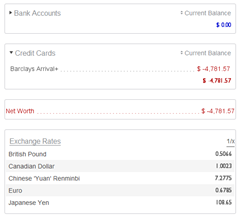 Trying out Moneyspire at the moment: nice UI but the data import is a right royal pain in the neck. Thanks for the reviews. Did you ever decide on a replacement?